The Red Scorpion Gang has been terrorizing the countryside for months, with evidence of their ill deeds appearing everywhere the rabbit ronin turns! Usagi first crosses swords with the Scorpions as the gang extorts protection money from poor farmers, then must defend a temple from their attacks. But when Usagi is accused of being a member of the gang, he has no choice but to take the fight to the Red Scorpion himself! This volume also features the return of wily thief Kitsune and the mysterious Lord of Owls! 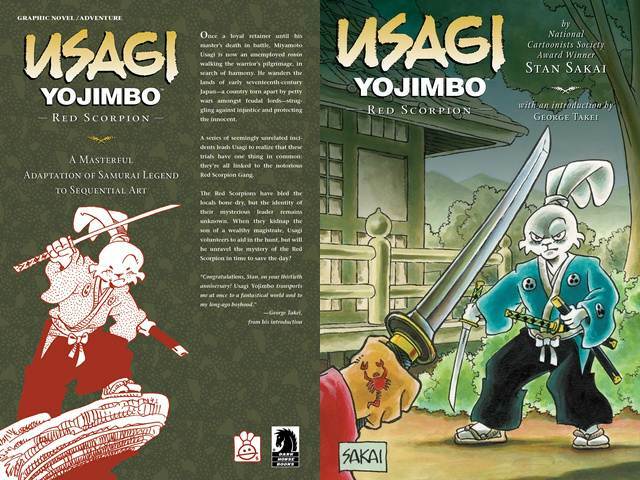 Collects Usagi Yojimbo #132-#138! Featuring an introduction by George Takei!